The Best T20 International Ever! I don't really know how I can capture in words what I experienced on Friday night at the Dubai International Cricket Stadium, but I'm still going to try. I probably will not do justice to it, but there are moments from that night that need to be captured. I have no doubt in my mind that I witnessed the best T20 International ever. The Pakistan vs India final of the first World T20 in 2007 was also an unbelievable game, but this Pakistan vs Australia T20 trumps it. Friday, 7th September 2012 will be remembered for a long long time, and decades later people will talk about that tied T20 game between Pakistan and Australia that was decided of the final delivery of a Super Over. What made it all the more exciting was the crowd. 20,000 people under one roof cheering the greens on. For the last 30 minutes or so of the match, I could not hear the person next to me. It was that loud! Phenomenal. Magical. Madness. No words can really describe what it felt like to first witness Abdul Razzaq get the wicket of Patrick Cummins of the final delivery of the match to tie the game and then to witness Umar Akmal scamper to the non striker's end to win the match for Pakistan off the final delivery of the Super Over. Actually Pakistan had won the game as soon as Cummins bowled a wide. According to the rules, if the Super Over is tied then the team that has hit the most boundaries in the match (including the super over) wins. Pakistan had hit 20, Australia 19. So that delivery after the wide was not really needed. But I'm glad it was bowled because winning that game of a wide would not have done justice to the crowd that erupted in the loudest cheer I have ever heard when Dan Christian missed the ball at the non-striker's end and Umar Akmal completed the run that brought Pakistan victory! Many of us were looking forward to watching Imran Nazir bat. His second ball duck quietened the entire crowd. As soon as Nazir got out, Shahid Afridi ran on to the field with water for Hafeez. The cheer he got from the crowd remained the loudest for the initial stages of the match. Hafeez and Jamshed were motoring along when Dan Christian produced one of the most outstanding catches you will ever see. It was the best catch I have ever seen at a stadium. It had all the 20,000 Pakistanis on their feet and applauding. Dan Christian is Superman really. He even pulled off another similar stunt and saved a sure shot boundary that had the entire crowd stunned once again. The catch was shown repeatedly on the big screen at the stadium and every time it was met with an applause. 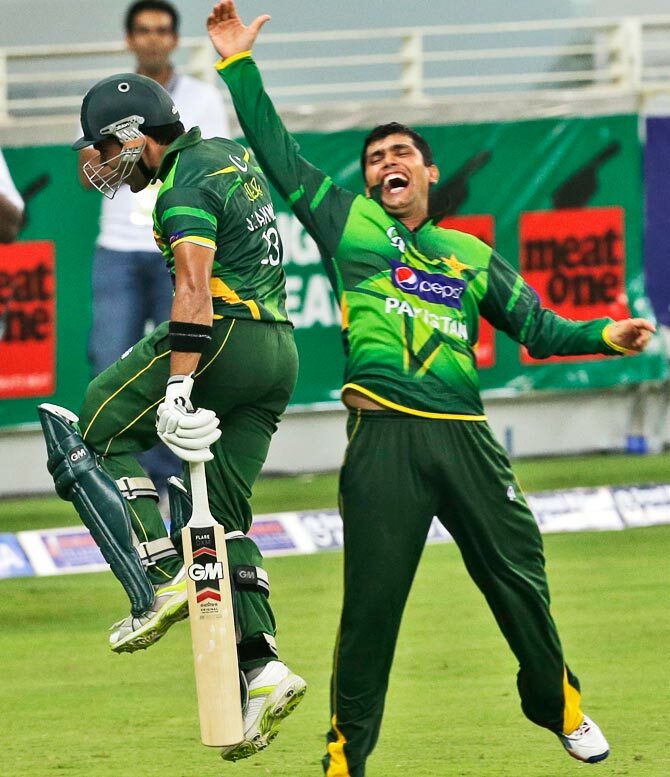 The Akmal brothers put on 46 runs for the 4th wicket partnership, and though Umar's contribution was only 13, the way he ran with his elder brother was unlike any other Pakistani pair. They stole singles, converted ones into twos, and upped the tempo at just the right time for Pakistan. Their understanding in the middle was apparent. Probably for them it felt like just another family game in their back yard. When Abdul Razzaq walked out to bat in the final over of Pakistan's innings, the Dubai crowd erupted in a cheer that I have only witnessed for Shahid Afridi. I was pleasantly surprised to be honest, but its good to know that people have not forgotten him. "Yaar agla Ajmal ko dena chahye"
"Nai nai Hafeez kare khud, phir Ajmal aur Gul ke aakhri dono"
"Buss aakhri Ajmal ko na de, 2010 semi final wala scene na ho jaye"
"Hafeez bahut pita hai aaj, Malik ya Razzaq ko ek over dede"
"Pehle dena chahye tha yaar"
"Malik aur Razzaq bhi pitenge. Captain hai, khud responsibility le aur karaye"
In the meantime, Sohail Tanvir had castled David Hussey, completed his over, and Ajmal had started the 18th over. 7. Who Said Only Footballers Can Fake? In the 19th over, Saeed Ajmal made a very poor attempt to stop a ball at short fine leg, which resulted in a boundary. His lame half-assed dive was not one that would have resulted in a "dislocated" shoulder. Yes that's what he said at the post match presentation. But Ajmal walking of the field holding his arm was the best act put on by a Pakistani fielder ever. His substitute was Yasir Arafat, who misfielded of the very next delivery in the same position as Ajmal, which resulted in another boundary. However, after that Yasir Arafat turned into a Super Sub! He ran out Matthew Wade with a direct throw from the boundary, he timed his run and judged the ball coming off George Bailey's blade to perfection giving Pakistan a much needed wicket off the first ball of the final over, and he ran like a hare during that last over keeping the Aussies down to a single at least twice. We had all expected that Umar Gul will bowl the final over, so when he was handed the ball in the 19th we broke into another discussion. "Yaar ghalti kardi Hafeez ne. Aakhri over phir spinner"
"Khud nai karega, Shoaib Malik ko dega"
"Ab to khud hi karana hoga. Captain hai, responsibility le"
We all went into shock when Shoaib Malik walked up to the bowling end after a lengthy discussion among 6 of Pakistan's cricketers. "Nai yaar. Malik! Isse hero banna hai kya Sania ke saamne"
And suddenly Hafeez changes his mind and calls up Razzaq. "Naheeeeeeennn.. Razzaq ne last kab bowling ki this International cricket me?" "Ghalti hai yaar. Rookie mistake, Hafeez should have used a 6th bowler earlier"
It wasn't by either of the Akmals, nor by Yasir Arafat, nor by either of the Aussies. The run of the night was shared by 3 spectators who somehow dodged the stadium security and ran on to the pitch during the course of play. Well 2 of them, the third one was hauled down by 5 men! The first man sprinted across the field with a Pakistani flag, circled a player or two and ran back into the stands before the security could even move from their places. The second person was a little kid who ran in when Razzaq came in to bat. 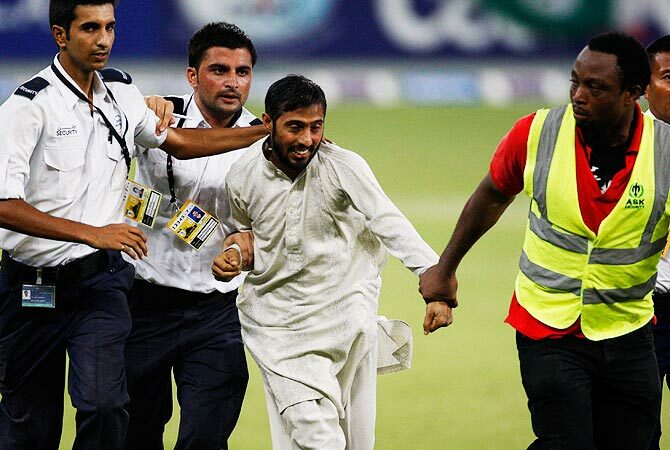 The umpire stood in his way, the kid dodged him, shook Razzaq's hand and ran back into the stands. By now the security at the boundary lines had doubled. But it didn't stop yet another spectator to run on to the pitch. This time the security was ready though. Took 5 men to corner and haul down this one. The first delivery of Razzaq's over took forever to reach George Bailey. It was that slow. But it was a rank long hop and we all felt that it was going over the ropes. But Yasir Arafat sprinted around and held on to a wonderful catch. The entire stadium, 20,000 people, erupted in the loudest cheer of the night. The 5th delivery of Razzaq's over was sent sailing over mid wicket for a six by Pat Cummins. It tied the game. The crowd went quiet. Game over we all felt. Hafeez hustled the troops. Men were called in to the inner circle. We all stood there, hands on our heads. For some on their hips. A few started to leave. It was over for the crowd. Cummins had sealed the deal for Australia. It was really quiet as Razzaq ran in for the final delivery, but once again the entire crowd broke into an even louder cheer than before as soon as Cummins hit the ball in the air and Pakistani fielders got under it. "Dont drop it please!" someone shouted, and the cheer reached its peak as Imran Nazir held on to it safely. Razzaq, who had almost given the match away, saved it at the end. The big screen said "Super Over" and we all waited in anticipation. As I said at the start, no words can really capture the emotions that the crowd went through during the Super Over. It was out of this world, and something that I had never witnessed before. I have seen a large number of cricket matches all around the world at various different grounds. But the intensity and excitement that I was a part of on Friday has never been matched before. Cheering, high fiving, hugging started inside the stadium and continued on to the roads outside the Dubai Cricket Stadium as fans danced to the beats of a dhol and celebrated a magnificent victory. The heat, the traffic jams, the sweat - all was forgotten once Pakistan won the game in a nail biting finish. It was the best T20 international I have ever seen, and by far the best international cricket match I have seen at a cricket ground. Absolutely amazing. Astoundingly written Umair Qazi sahb You are a legend. A talented writer I've ever seen. Indeed a wonderful game of T20 cricket, and WHAT A BEAUTIFUL PIECE! Hats off to you sir!